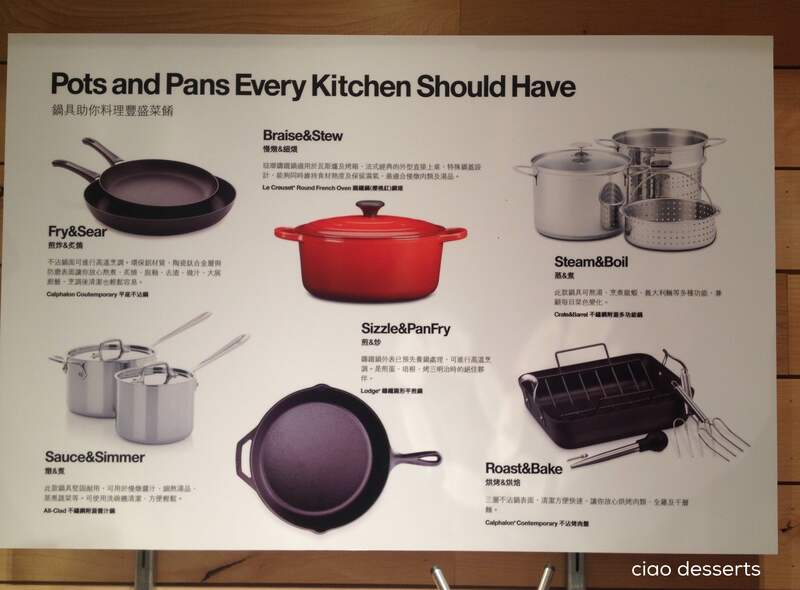 As you may know, I absolutely adore a good kitchenware shop wherever I am in the world. 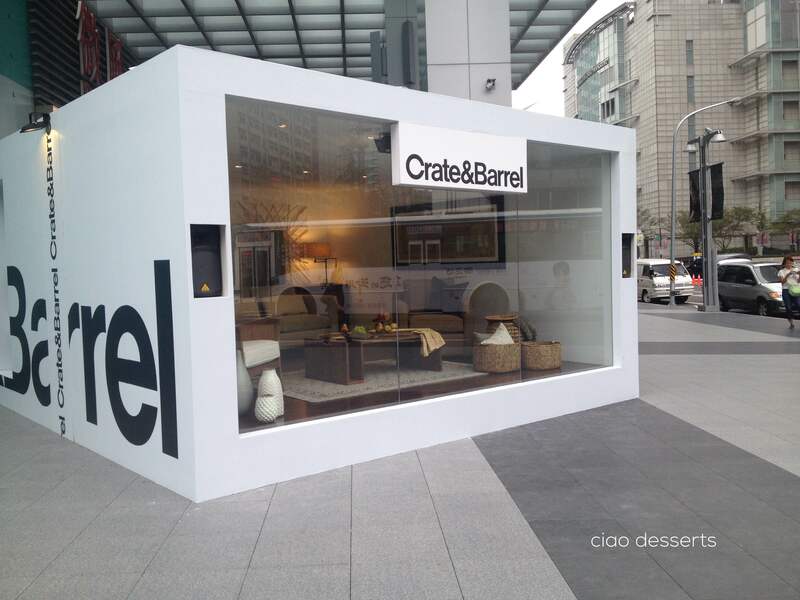 So you can imagine my delight when I found out Crate and Barrel opened up in Taipei! The store located in the Xinyi District of Taipei, in the basement level of the new branch of the Breeze department stores. 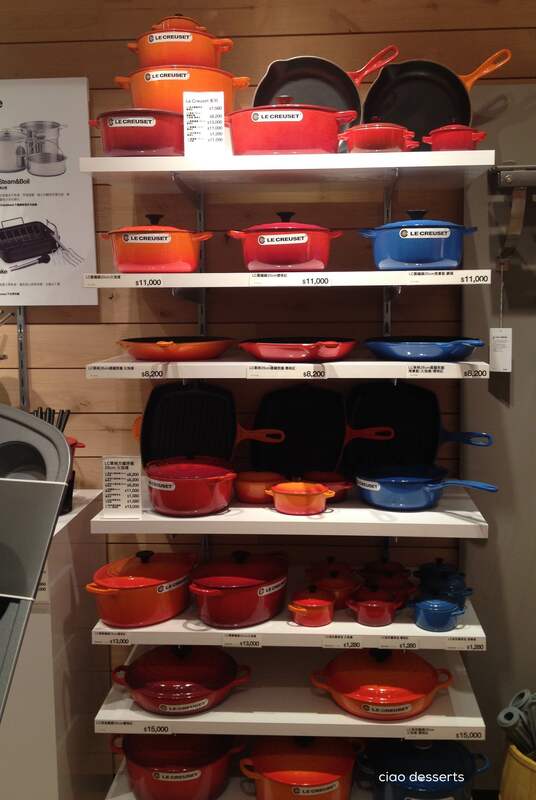 The first items to catch my eye were the towering stacks of colorful mixing bowls and baking pans. I like how the items are displayed so you can clearly see all the different sizes and colors available. The baking pans section was also quite impressive! I wish I had an oven that big so I could buy that enormous cookie sheet on the bottom shelf. I’ve noticed that American style home stores are set up a bit differen than the ones here in Taiwan. One difference are the informational posters displayed throughout the stores. I really think it’s important to learn about the product before you buy it. Sometimes you have time to do research beforehand, but other times, it helps if the store signage has the information you need. I’ve observed that Pantry Magic in Hong Kong does some of this, and I think it would be so helpful if other stores did the same! I think the marble rolling pins and cutting boards are great for Taiwan’s kitchens. Often times, the weather is hot and humid; so if you are rolling out cookie and pie dough, they tend to soften and become sticky too quickly. Having a nice cool surface, such as marble might alleviate that problem a bit. Tools such as wooden spoons and rubber spatulas always catch my attention because they are hard to find in the right shape and handle size in Taiwan. I beg my friends to bring back wooden spoon for me from the U.S. Then I guard them with my life and refuse to let anyone take them out of my sight. 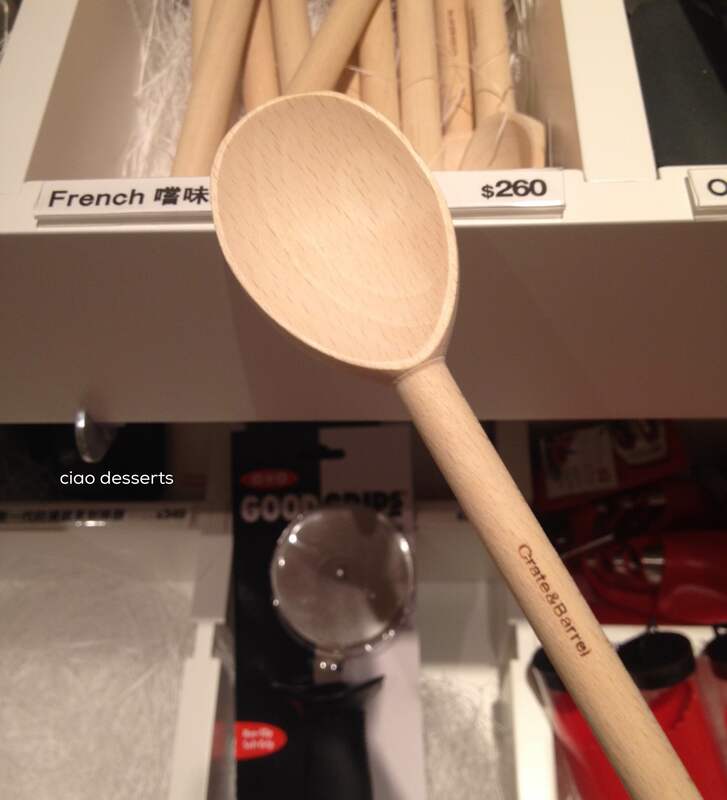 The one at Crate & Barrel is made in France, from 100% beechwood. 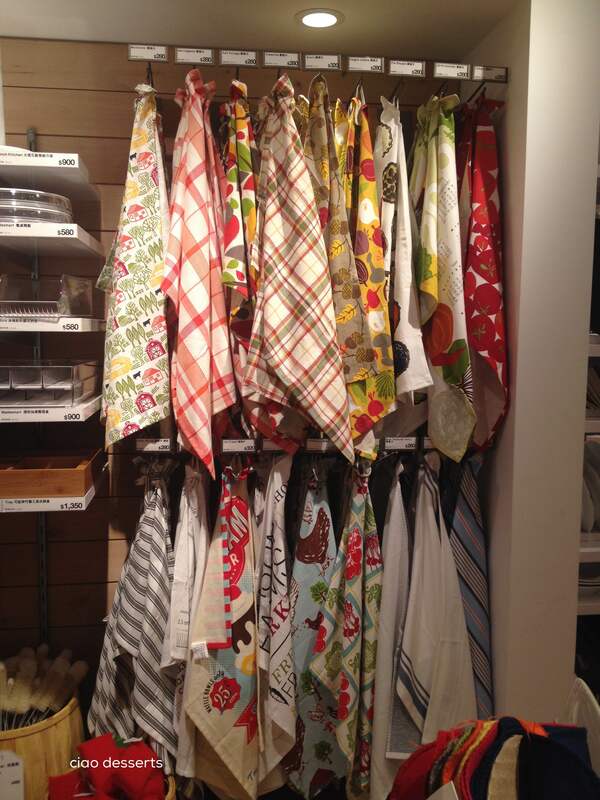 Another item I really enjoy having in my kitchen are brightly colored dishtowels. I actually bought this one and hung it up on my kitchen wall after seeing this post on Apartment Therapy. And I glance it frequently whenever I’m in my kitchen about to pop something in the oven. 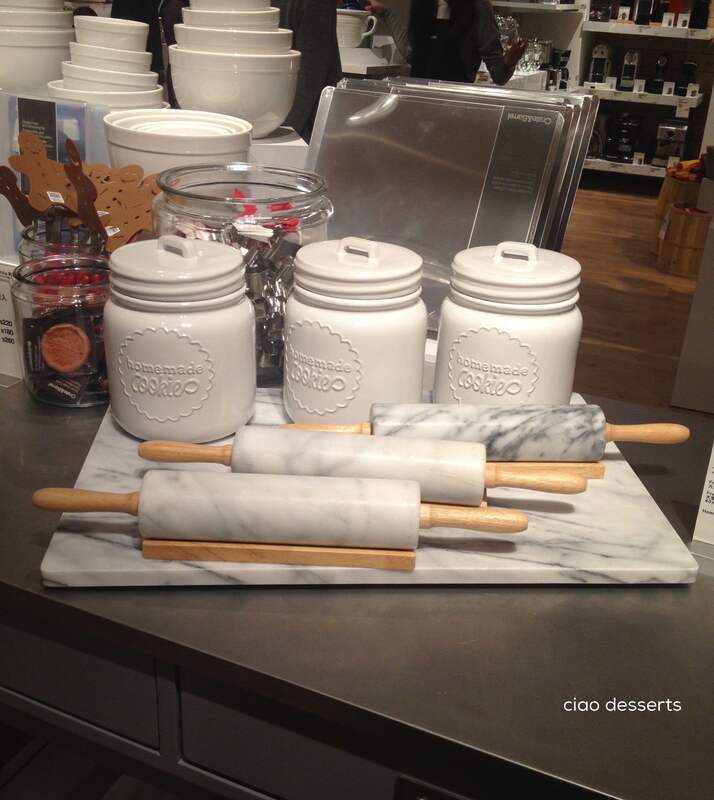 I was also pleased to see the Oxo pop up storage containers at Crate and Barrel too. I think a true sign of adulthood is when all your storage containers match. Right now i have a confusing tangle of Lock n Lock boxes, Muji enamel containers, and random Tupperware stolen (ahem, borrowed) from my parents. In my mature adult life, I would have this matching set of Oxo containers. The price difference stopped me from buying the containers right then and there (maybe I’ll have to make a trip to the U.S. for them… which will make them a total bargain then) But in all honesty, I love to see anything and everything Oxo. I bought the swivel vegetable peeler, and my life was never the same afterwards. I liked it so much that I bought one for everyone in my family. Of course I didn’t walk away from Crate and Barrel empty handed~ but I wanted to use and review the items a few times before showing you all. This entry was posted in Uncategorized and tagged crate & barrel, marble, OXO. Bookmark the permalink. ha! this post reminds me of my excitement when i found out that muji was opening up a location in san francisco. funny how you crave the western products and stores while i long for the asian products and stores. although, i have to admit, i do get a bit ga-ga when i walk into sur la table. hmmm… i was just thinking i needed a new peeler. will have to check out your favorite. Definitely try the OXO peeler. It’s the best I’ve tried so far. I feel the same way about Sur La Table… and Williams and Sonoma. Good thing we don’t have either (yet) in Taiwan, or I’d be bankrupt.